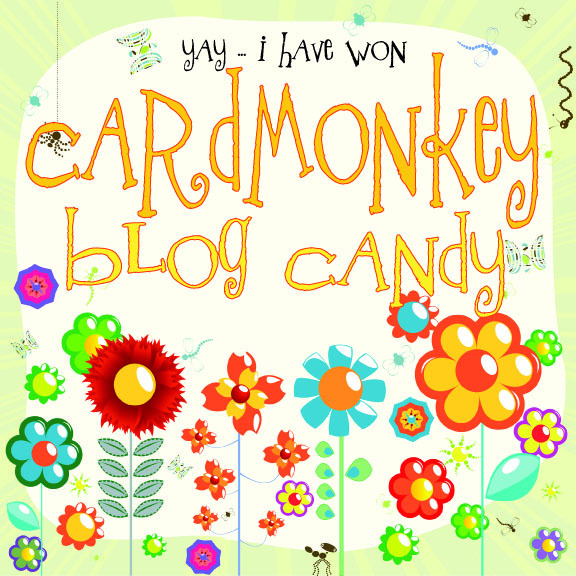 CardMonkey's Paper Jungle: New Projects ... and A Blog Candy Winner! of year ... dreamy, sleepy and exhausted! Thank you, all, for your kind comments about the Disney vignettes I made and donated to The Children's Hospital of Philadelphia's Seashore House, as part of Shawn and Melissa's fantabulous Disney Pixar Blog Hop. 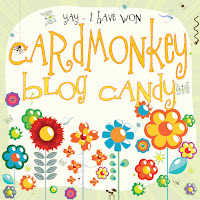 Like so many Americans, money is very tight in the CardMonkey household this year. John's been searching for full-time work for almost a year now; and, my job covers more things than it ever did -- including our family's health insurance. I'm blessed to have the coverage, so believe me, I'm not whining. Where Christmases of the past were extravagant in terms of spending, I need this one to be one from the heart. I made these Christmas Cheer Containers and plan to fill them with homemade cookies, or Hershey's Kisses. The jar on the left is a recycled jelly jar. 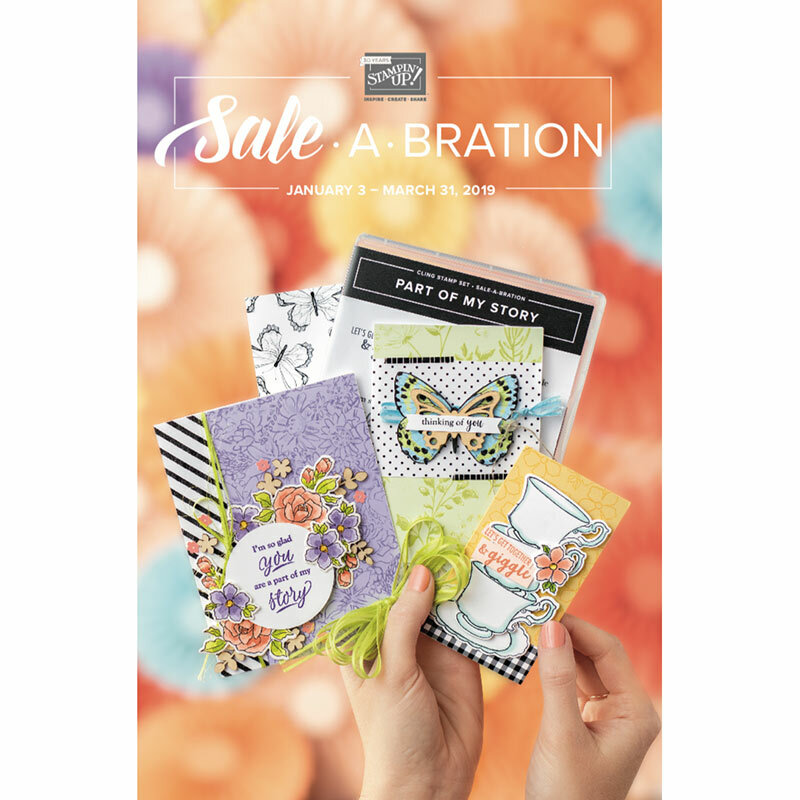 I've been saving these all year long -- I love their shape and the gingham lid. I used a Waltzing Mouse Stamp for the label, added two eyelets on the sides to secure the ribbon. I hole-punched the holly add-ons, using a Martha Stewart punch, and accented with Glossy Accents and seed pearls. On right, is a tube that I purchased a while ago. The label inside is also a Waltzing Mouse Stamp. 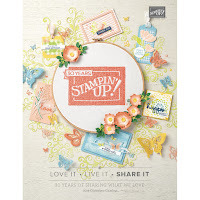 It's embellished using Martha Stewart punches (Laurel leaves), baker's twine and upcycled ribbon off a package. "Ellen, I love your wall art! I bet it really brightens up the children's day when they see it. My favorite (and it was really hard to pick because they're all so wonderful) is Roo flying the kite because he looks so happy to be doing it and he looks so carefree." Thanks for sharing this with us, means a lot and also inspire where so many of us is sitting with the same thing, lol, my tree is a A5 card cut tree, hehehehhe, but it is there, even just for me, that's ok too. What a great gift idea. They are beautiful and I bet the cookies inside will be so tasty. 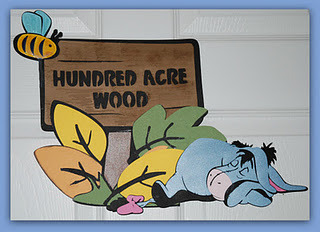 Also love that Hundred Acre Woods wall design. So vibrant. These are too cute. I'd love to get one..;) I think they will be great gifts. You really were able to decorate them nicely -- such a nice accent to the contents you'll be putting inside. Homemade gifts are sometimes the very best gifts of all. 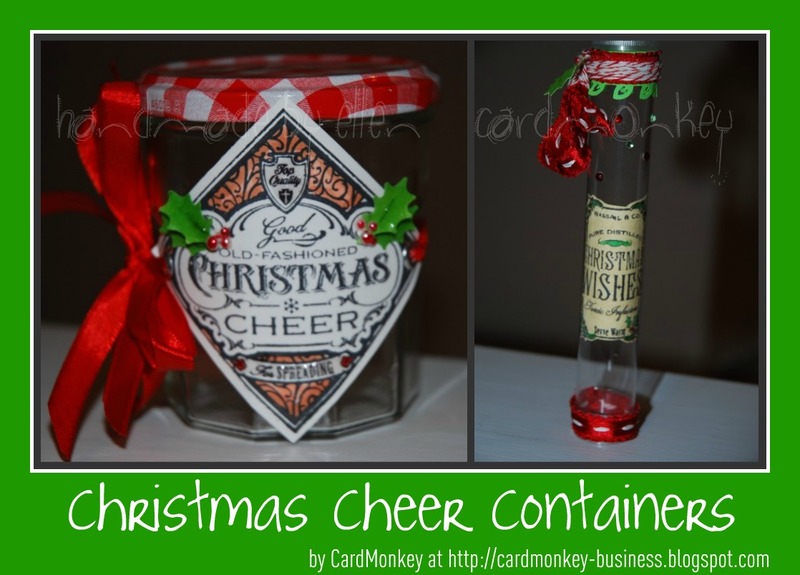 Awesome Cheer Containers Ellen. I too, keep jelly jars. They are so adorable even plain and you have done an excellent job "sprucing" it up!!! I love what you did with that jelly jar. I understand the hard times believe me I think everyone of us in one way or the other does. I am making alot of my own Christmas presents this year also. I hope the receiver feels the same as I do, I would rather have a gift from the heart any time over a store bought one. Its the thought, time and planning of the home created gift that makes it so much more valuable to me.